Our latest case study demonstrates how we support a large independent school to recruit the right support staff effectively and efficiently. 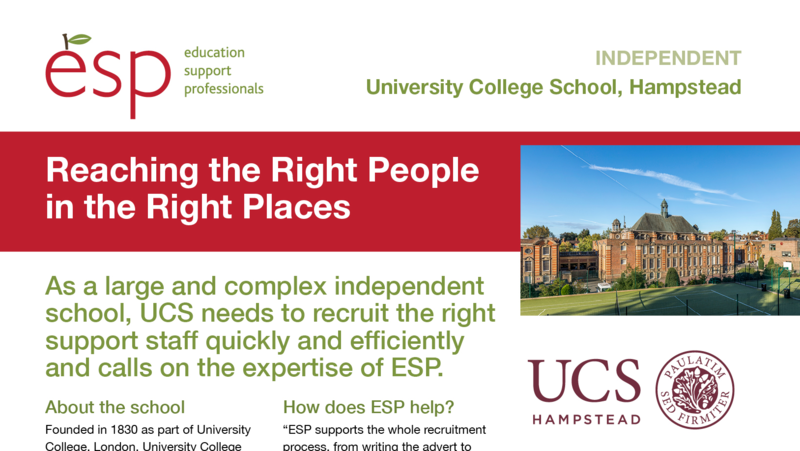 As a large and complex independent school, UCS needs to recruit the right support staff quickly and efficiently and calls on the expertise of ESP. Founded in 1830 as part of University College, London, University College School, educates over 1200 pupils in four schools across three sites. The foundation employs 300 staff including 70 support staff and IT Director, Prad Samtani, leads an IT team of six which supports all three schools. IT Director, Prad Samtani explains, “At certain times of the year, our human resources team has to focus on teacher recruitment and does not have the capacity or reach to recruit for the specific support staff skills we need. An example is recruiting into the IT team, we can receive 100s of applications, 98% of which will be unsuitable. The administrative burden to filter through the applications is extremely heavy and diverts the team from recruiting teachers. “ESP supports the whole recruitment process, from writing the advert to assisting with interviews. “The most valuable parts of the service are the initial stages. ESP uses its education sector experience to write excellent adverts and its channels to target the right people, people we can’t reach ourselves. Once applications come in, ESP filters them and telephone interviews anyone they feel is suitable. They then conduct face-to-face interviews and only present candidates to us they know are suitable. “Once we select our candidates, ESP helps arrange an efficient interview process too. They arrange the interviews and, if a colleague doesn’t have interviewing experience, ESP joins the interview panel. “We also use ESP when we need temporary cover and their established list of experienced candidates means we can quickly fill roles. This service is priceless. What is the impact of working with ESP? “ESP completely removes the burden of recruiting support staff. Their reach ensures we attract the right people, saving us so much time in filtering out the wrong people. The candidates they forward to us are always excellent and we generally interview them all. Once in post, ESP is always on hand to offer additional support, long after the appointment. Call us for an informal chat about how we might support your recruitment on 0845 686 0690.